In the minds of many, the Sahara exists as the boundary between ‘Arab Africa’ and ‘Black Africa’. The latest issue of Chimurenga’s pan African gazette, the Chronic, departs from and contests these crude fictions about the place we live. Designed in collaboration with Studio Safar in Beirut this special edition of the Chronic – published in its entirety in Arabic as Muzmin – argues that the Sahara has never been a boundary, real or imagined. Trade caravans, intellectuals, literatures, human resources and political ideas have long circulated from Timbuktu to Marrakesh, from Khartoum to Tunis and Cairo and beyond. 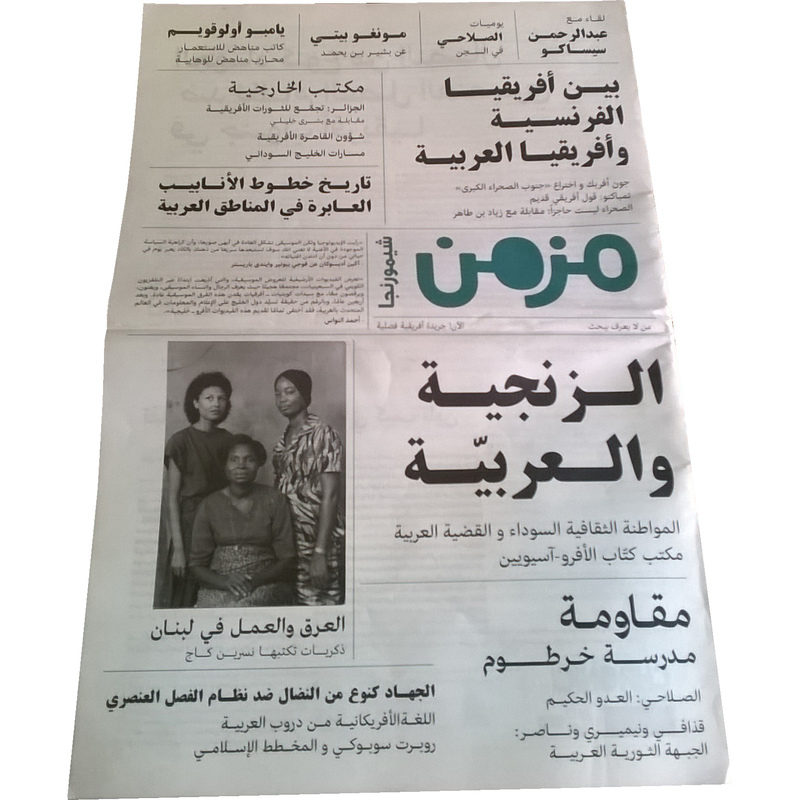 In this issue, Helmi Sharawy remembers the host of African liberation movements that had offices in Cairo during the time of President Gamal Abdul Nasser. In Timbuktu: An Old African Saying, Akin Adekosan looks at director Abderrahmane Sissako’s Timbuktu and the politics surrounding its production and release; elsewhere in Beauty Will Save the World, he has an encounter with the film-maker. Wendell Hassan Marsh follows the route from Françafrique to Afrabia and finds that liberal Islam has long been imagined by Africans and Arabs alike. Dominique Malaquais and Cédric Vincent write that the story of the pan African cultural festivals which were staged on the continent soon after the colonial era – from PANAF, the first Panafrican Cultural Festival organised in 1969 by the Algerian government, to FESTAC ’77 in Lagos – is one of entanglement and a shared vision of an Africa yet to come. Read Archie Shepp’s Shirt Suggests. Andrew Apter looks beyond negritude in Black Cultural Citizenship and the Arab Question Question in Festac ’77. In The Pharaoh’s New Clothes, Sophia Azeb reads the publication Lotus: Afro-Asian Writings as a record of the convoluted negotiations between “Arab-Berber” northern Africa and the continent south of the Sahara (more or less). Hassan Musa recounts the rich experience and influence of his teacher, the great Sudanese artist Ibrahim El-Salahi. Jamal Mahjoub revisits the Sudan in the era Nimeiri in Rumble in the Nile. Elsewhere, literary scholar Ziad Bentahar sits down with Marcia Lynx Qualey and wonders why the identities of ‘Arab’ and ‘African’ seem, from our contemporary vantage point, as though they are two separate categories. And Saarah Jappie traces the Arabic roots of Afrikaans in Cape Town. Na’eem Jeenah engages jihad as a form of struggle in the resistance against apartheid.